I love the way food brings family together. And speaking of together, this exact Pumpkin Roll recipe was the one that was served at my parents wedding reception (see pictures below) back in 1984, we they were brought together forever. Both my grandmothers and my mom helped make tons of these to serve at the wedding reception. This recipe is meaningful to me because of that, but not only is it sentimental it tastes divine. 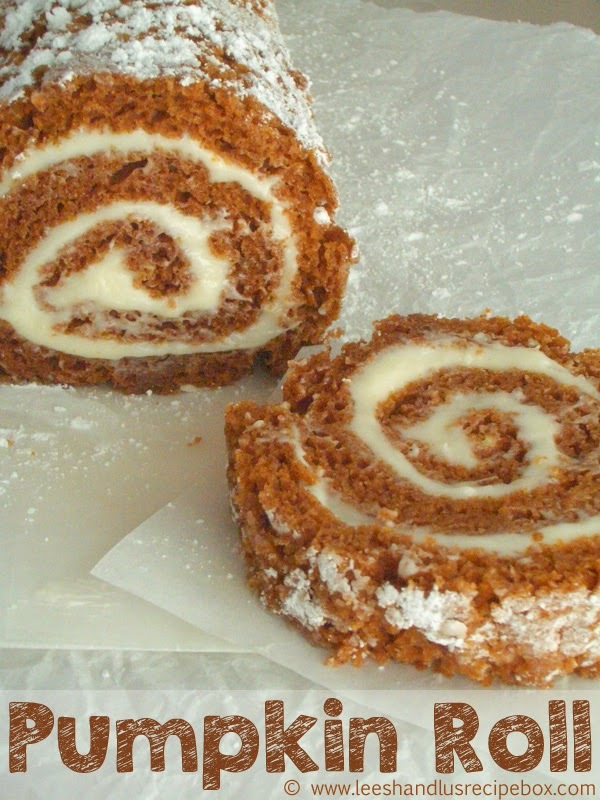 Have you ever had a pumpkin roll? If not, let me just tell you what they are all about. The cake-y layer is made up of a moist spiced cake made from scratch. Then it's filled with creamy rich cream cheese frosting and rolled up. It's very elegant looking and it sure to please the kids and adults. My 4 year old daughter loves anything spiral, becasue she think it looks cool. I have to admit, I love that too. There is something about that swirly look that gets you and you just want to eat it around in the spiral. Kind of like Cinnamon Rolls are for me. I like to save the center for the late bite becasue it's the most tender. Mmmm. I've included step-by-step instructions on how to make this. It's different than any other dessert I make, but it's not hard. I think these are perfect to serve in the Fall and Winter. And in case you aren't a pie person or want something special besides pie for Thanksgiving, this should do the trick. I just had to include some pictures from my parents wedding day. I love these pictures! I'm so glad my parents are together forever! Love you Mom & Dad! The recipe is down below. Here is a handy picture tutorial. After mixing the cake batter you'll generously sprinkle powdered sugar on a clean flour sack towel. When the cake is done, you'll immediately turn it over onto the powdered sugar towel. Then you'll lift the pan off, being careful not to burn yourself. Then carefully peel the parchment off, it shouldn't stick really, you had lots of butter on that pan and on the parchment paper. Then you'll start rolling up the cake with the towel on one of the short sides . Fold the end over before you start. Once it's all rolled up let it sit for 10 minutes. During those 10 minutes add the powdered sugar, butter, cream cheese, vanilla and dash of salt in a medium size bowl. Using a hand mixer whip the frosting until smooth and creamy. When the 10 minutes are up start carefully unrolling the towel. Once it's all the way unrolled you'll see that it has some shape to it from cooling in a spiral. Dollop the frosting on top. And spread evenly all the way across the cake. And start rolling it back up again. 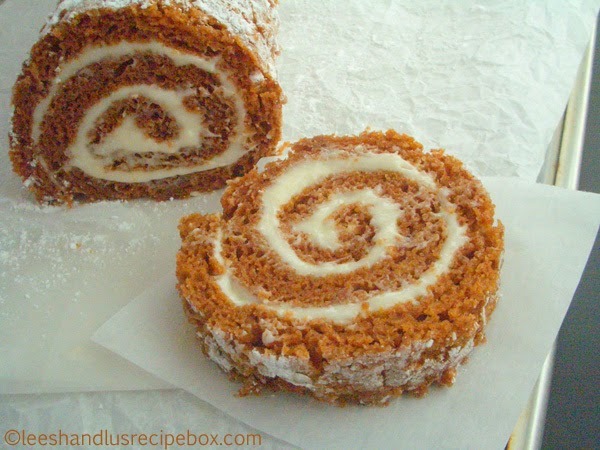 Place the beautiful pumpkin roll on some waxed paper or parchment paper and roll up. This will help it not stick to the wrapping. And put it in the fridge next to your jalapeno pepper and let it chill for at least a few hours. It also freezes well if you want to make it ahead of time and take it out to thaw. Sprinkle additional powdered sugar on top if you desire. Cut by tying with dental floss in the size sections you want. And enjoy! *Notes: You can bake this in a 10x13 jelly roll size pan or in an 11 x 17 half baking sheet size. The directions below indicate the bake time and temp for an 11 x 17 - if you want to do the jelly roll size - follow all the same instructions but bake at 375 for about 12-15 minutes. This also freezes great if you want to make ahead and then thaw before serving. Preheat oven to 350 degrees (see note above). Grease a 11 x 17 baking sheet with butter and line with parchment paper so that it overhangs on the short ends a few inches on each side. This will make for easy removal. Butter the top of the parchment as well. In a medium size mixing bowl beat 3 eggs. Add the sugar, pumpkin and lemon juice and mix until smooth. In a separate bowl combine the flour, soda, nutmeg, cinnamon, salt and ginger; whisk until combined well. Gradually add to the wet mixture and stir until combined, taking care to not overmix. Pour mixture into the well greased and lined baking sheet and smooth evenly. Bake for 12-14 minutes or until you can insert a toothpick and only a few moist crumbs. While the cake is baking lay a clean flour sack towel on your counter and sprinkle generously with powdered sugar in an area that is as at least as big as the pan. After the towel is ready start prepper the cream cheese filling. In a medium size bowl combine the cream cheese, powdered sugar, butter, vanilla and salt. Whip with hand mixer until smooth and creamy and set aside. When the cake is done immediately dump it onto the coated towel and start rolling up on one of the short ends. Let it set for 10 minutes. After the 10 minutes unroll the towel gently and spread the entire cake with the filling and start rolling it back up on the same end you started with before. Once it’s rolled place it on wax paper or parchment and wrap it up, and wrap again in foil. This helps it so it won’t stick to the foil for easy serving. For best results; chill for several hours or overnight. When ready to serve remove from wrapping (sprinkle with powdered sugar if desired) and tie with dental floss to cut. Enjoy! Lightly adapted, from my Grandma, Kathy K, made changes to baking temp and time and pan size. This was served at my parents wedding reception.